Being that it’s traditional to eat buckets of chips paired with some sort of sauce on these days it’s only right that we start this off with a dip recipe. I know we are leaving fresh corn season (bye Summer, we’ll miss you and your produce!) but that’s no reason to leave all corn recipes behind as well — canned corn is perfect in dips. Here it’s mixed with some chilies, some Monterrey Jack cheese (the “hot” in the title is taken literally here) and after a few minutes in the oven, turns into one of those things you won’t be able to stop dipping a chip into all night. Bonus points that this reheats well too, on the off & unheard of chance you have any leftover. Cheese and pepperoni will make themselves to a football some way, some how, even if they are hitch hiking on the back of a cracker or hanging out on the side of a cheese plate. Both of those ways are fine but mixing them with bread = even better. I have not tried this exact recipe yet but it’s similar to one I have made before except way easier, so I have to support this one. 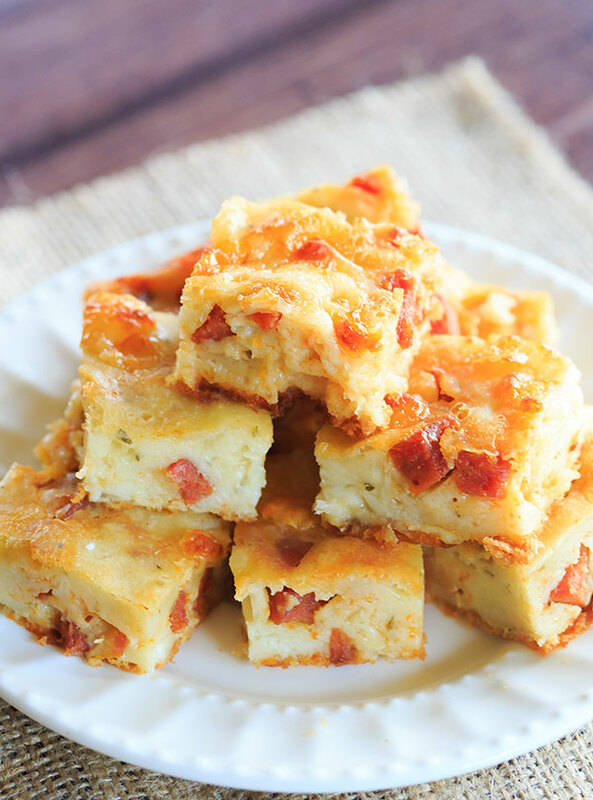 Pepperoni and two different kinds of cheeses are mixed into a batter, which is really serving as a fancy vehicle for you to eat lots of cheese & pepperoni. The flavors all bake together (the pepperoni oil makes it way through the whole bite!) and turns these bites into a must-try. Please put your weird looks and side eyes away — I know this sounds like an odd choice to make for a day where we don’t really care about health because this is a pretty healthy dish. But that’s not why it’s here, it’s here because it’s delicious, health or not. Roasted chickpeas are flat out one of the most addicting snacks I’ve ever made. It is pretty impossible to make these and not eat the entire pan within minutes — I’m speaking 100% from experience here. 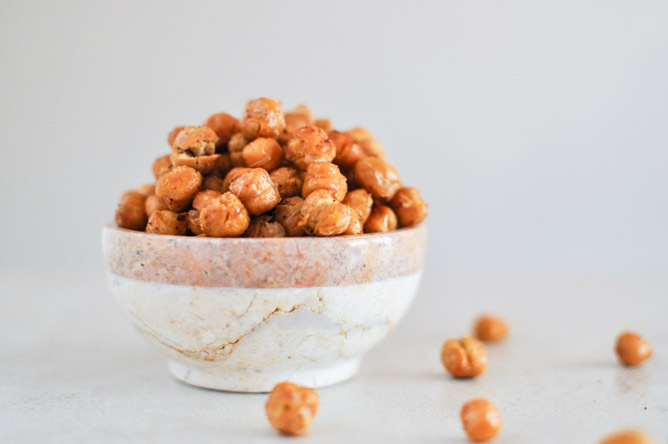 Chips, pretzels, store bought snack mixes all have their place on game day but I think once you make these you’ll be choosing roasted chickpeas every time. Even if you aren’t looking to eat something healthy, at least you won’t have to feel so bad if you eat handful after handful of these. These nachos come across deceivingly simple looking but you shouldn’t let that fool you into thinking they are just basic nachos. I’m not even the biggest nacho fan (I know) but I actually crave these and make them time and time again, not just on game days. Any recipe that can turn a non-fan into a craving-fan is a special one. The marinade that the beef sits in in combination with the onions and peppers that you sprinkle on the nachos is really out of this world. Make a huge pan of these and try to share them with everyone, even though I know how tempting it’ll be to keep them to yourself. Are you into serving an entree for game day, instead of just having a bunch of snacks and/or ordering pizza? I think we should all be into serving an entree on game day (the more food the better here) especially if the entree is these enchiladas. These are ridiculous. And one of the best parts? They’re completely meatless, making them even more attractive if you are vegetarian or people joining you are. Because there is no meat, the roasted poblano peppers really get to shine here and the result is very fresh, unadulterated strong flavors from the enchilada filling. This dish takes a bit to put together so I highly recommend doing it the day before and keeping it in the fridge until it’s time. Then you can just heat it up in the oven and you’re ready to eat! I find that sweet treats tend to get overlooked on game days. But with all the salty, savory food around you really should have something to cut the sweetness. These balls will help to keep your sweet-salt balance on point. Because you have to toast the pecans here, they take a little forward thinking but once you’re done with that (which you can actually do a few days in advance) your food processor really does the rest of the work for you. A integral part of these is pecans so if you have a tree nut allergy like I do: I’ve made them with peanuts instead with no problems. I should say that everyone except for me preferred the pecan version, though, so I’d make a batch of both. You can never go wrong with more sweets. Let’s kill two birds with one stone, or two cravings with one fork, and make a seasonal recipe for a different seasonal day. Apples are in season in most places now so it’s the ideal time to stick them in a cake to serve while you’re watching the game, or drowning your sorrows if your team lost. I love this recipe because it’s heavy on the apples, so they don’t get lost like they sometimes can in baked goods. You’ll see at the link that this is supposed to be covered with cream cheese frosting but I never make it, opting for a coating of powdered sugar or nothing at all instead. It’s less messy to eat and more suited for a game day party that way. What are your game day staples? Featured image is from Janet on flickr.